When prompted about good cafes to visit in Singapore, rarely does a café outside of the East or Central Singapore come to mind; and especially not one from Sembawang. Common Chefs Café & Bakery is an exception and it will be a good enough reason for you to make a trip down to this Northern part of Singapore. A café plus bakery, Common Chefs Café & Bakery offers a wide spread of Western dishes, drinks, delightful desserts at affordable prices. Here’s what to expect if you are taking a trip down. The Single Cheese Burger (S$13 for beef, S$12 for chicken and S$11 for fish) features a juicy single patty packed together with freshly sliced tomatoes, cheddar cheese, mustard, mesclun salad and ketchup in a beautifully buttered brioche bun. All burgers come with fries on the side. We thoroughly enjoyed the beef patty which was extremely tender and bursting with flavour. For an additional S$1, we upgraded the regular fries to truffle fries. While it was decent, it was not the best truffle fries we’ve tried. As matcha lovers, we could not help but order the Matcha Latte (S$5) which was not too sweet and the notes of the matcha really came through. Common Chefs Café & Bakery gives you the opportunity to customise your own Dessert Waffle. We decided on the charcoal waffle (S$7.50) with a scoop of salted caramel ice cream (S$3.50 for a single scoop; S$6 for a double scoop) topped with a wonderful caramel sauce. As the salted caramel ice cream (and caramel sauce) was surprisingly sweet, we were glad that we chose the charcoal waffle as its neutral and muted taste complemented the sweets perfectly. 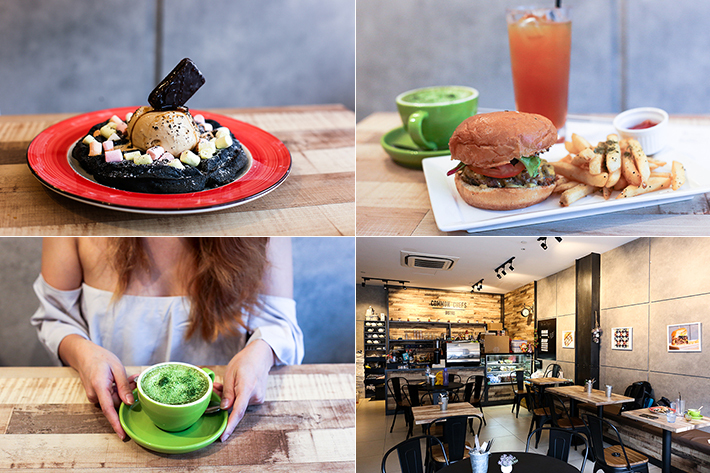 Common Chefs Café & Bakery is a hidden gem for folks who are staying in the North of Singapore. A member of the team at ladyironchef, Claire’s mission is to lead a life without regrets – to explore the world and its treasures boldly. When she isn’t pursuing her interests in writing, academia and music, Claire spends her free time with family and her pets. She also hopes to run her own animal shelter in the future. Just saw on their fb they are closing.